From use of chemical colours and screen prints to water woes and lack of awareness, the block printing artisans face many dangers. But a few people are working to make this skill alive again. This is the jounrey of beautiful hand block prints and their survival. 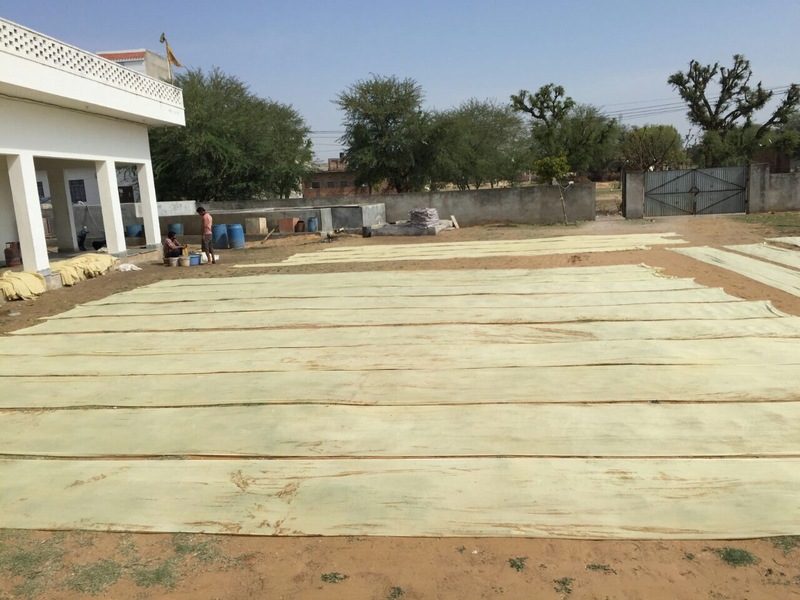 “The work, which used to provide employment to about 100 people, can now be done with the help of only two people. If people stop this (use of chemical colours and screen printing) then a lot of people can get work. So many artisans have become unemployed because of screen printing,” said Rinku Chhipa, a block print artisan from Jaipur. Rinku is not the only artisan who has suffered from the changing dynamics of the hand block print market. The art, which was once flourishing and attracted customers from all across the world, is now struggling to survive. The brutal competition, use of chemical colours, digital and screen prints all add to the artisans’ woes. Even artisans who have been working in this field for several generations do not want to continue this profession. “The charm of hand block prints isn’t the same now. We want our children to pursue this skill further, but if the situation remains same we would not want our generation to take this profession and art forward. Screen print and chemical colours have adversely affected our work. The demand for our work has dropped a lot due to screen prints.Even the government sometimes tells us to shift or shut down our factories. We never receive any benefit or incentive from the government,” said Shri Rajkumar Dhanopia, another hand block printer from Sanganer, Jaipur. The big iron screens with designs are used as stencils to create designs on the cloth. The screen printing was introduced about 40 years ago to meet the rising demand for block prints. But over the period, this style has overpowered the traditional, delicate and slow process of hand block printing. Screen printing can produce a large quantity of prints in extremely less time and labour. In addition, chemical colours are used for screen printing. These colours dry faster as compared to natural dyes and fasten the printing process. What takes a few weeks to create a unique a piece of cloth with hand printing takes only a few hours for screen printing. “Digital and screen prints have severely affected our work. People are not getting employment. Traditional artisans who were earlier using natural colours and were in hand block printing are shifting to screens. Also, the cost of original hand prints is higher than the screen print because ours is an authentic work. So people who do not have much knowledge they go after cheaper and screen printed products,” said Lal Chand Derawala, a traditional hand block print artisan from Bagru. 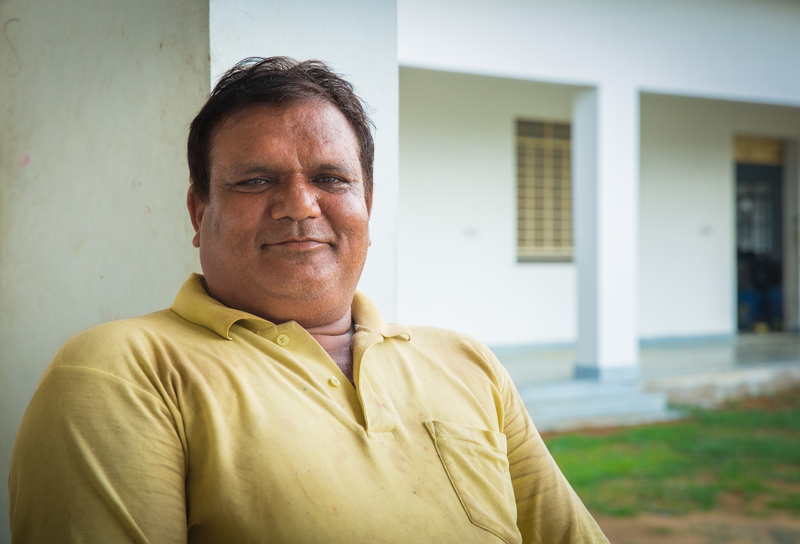 Lal Chand and his family have been working in this field for generations. He also won a National award by the government of India for his quality work in the field of block printing. Screen prints are not the only challenge here. The use of chemical colours is yet another issue. The water used to wash these screens goes into local rivers, which pollutes the water. This water is then used to irrigate the crops, which causes several health problems. 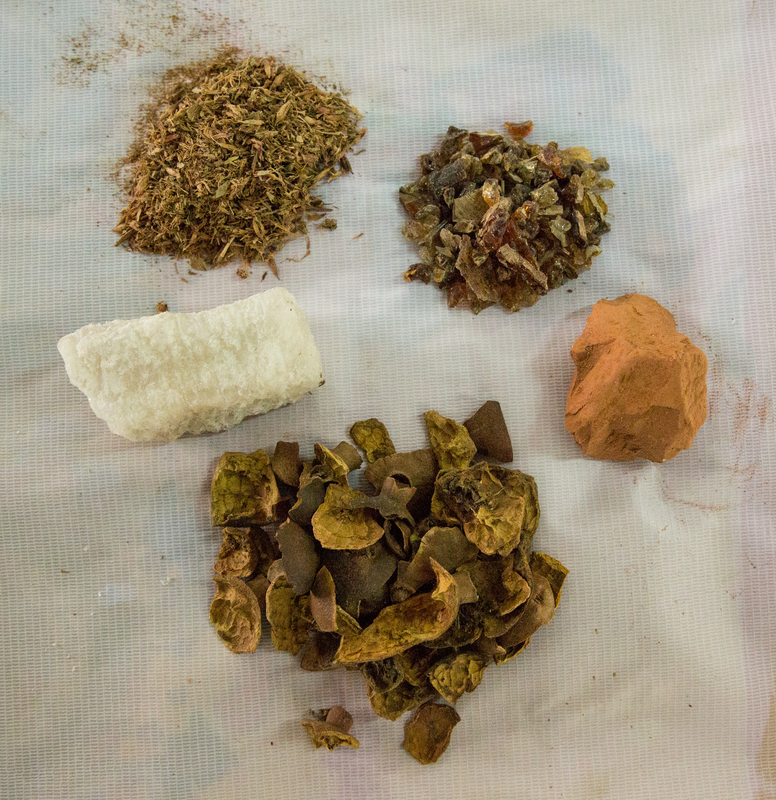 “If one even drinks the dirty water of Bagru’s natural dyes, he/she won’t fall sick. But drinking this harmful chemical water is extremely dangerous. It can take lives,” says Amit, a resident of Bagru. To reduce the time period, cost and increase the profit margins, even hand block printers are using chemical colours. These dry faster than natural dye and do not require washing. “The colours we use are completely natural. It does not harm anyone. The cloth does not cause any harm, even if worn daily. But these chemical prints are harmful to both the people and the environment,” said Lal Chand. Rajasthan has always been a place with the scarcity of water. The production of textiles is very water intensive. From raw materials to the finished product, water is needed at every stage. The discharge of synthetic dyes and other chemicals has added to the water pollution. The solution of this water issue is setting up a common effluent treatment plant (CEPT) that would achieve zero discharge, and recycle and reuse around 90% of waste water. But it is not that simple. The 15 percent of the total cost of setting up these plants is to be borne by small units. “Why should we pay the money to set up these plants? We are not the ones creating chemicals. There is no pollution of any kind caused by our work. If the government wants to test, they can do it without hesitation. Ours is a small cottage industry and all the family members run it on their own,” said Rajkumar. Also, any ban, tax and penalty that government imposes on the block printers for using chemical colours are borne by other artisans as well. 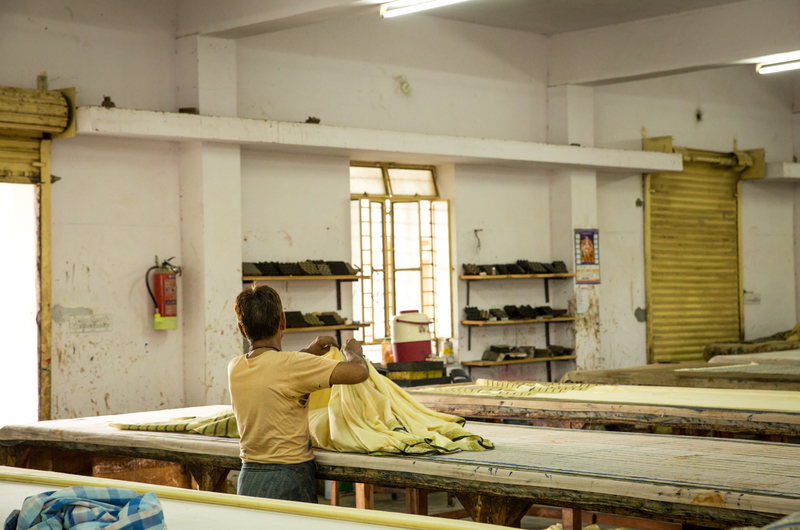 There is no exemption given to the artisans using only natural dyes, which further breaks their confidence. Considering the depleting condition of block printers, the government has provided GI (geographical indication) certificate to this artisan community. This certificate empowers the whole artisan community and recognises the uniqueness of these products. The GI certificate also ensures that these products are made in the specified locations only. But neither artisans nor public is properly aware of this certificate. This lack of awareness has led to no or little improvement in the condition of the artisans. “The condition is such that even our children do not want to continue this skill. It is a work that requires a lot of patience, hard work and dedication. Most artisans are not literate, they cannot find other jobs neither they continue this profession. This way, unemployment is gradually increasing,” said Lal Chand. In spite of several challenges, the original artisans are determined to take this art forward. They are trying to keep this 400-year-old skill alive. They believe, there is no replacement of original work. “People who understand hand work and want only that will not compromise on quality. In spite of the high price and limited prints, they buy original products only. There is no limit to create cheap products, but we have to maintain the authenticity of our art,” said Lal Chand. Lal Chand Derawala, a hand block artisan from Bagru. Gradually artisans are also trying to cope with the market and are seen experimenting with the new designs, colours and prints. Some of the artisans have thousand of wooden blocks in their collection and they keep buying new ones to remain relevant in the market. Lal Chand, who earlier created long fabrics only has now started making sarees, dupattas, stoles, suit sets, etc. He has also collaborated with the students of NIFT (National Institute of Fashion Technology), who help him to come up with new designs and be ahead in the market. “Our mind is always stuck on old traditional prints, but these kids help us to come up with new designs and experiment with our work,” said Lal Chand. In the year 1997, a group of Hand Block printers and exporters formed a Consortium under the Aegis of UNIDO. The body was named as “Consortium of Textile Exporters” (COTEX). It was done in order to upscale and promote the traditional technologies, keeping in line with modern needs and usage. Companies like Anokhi and Mehera Shaw are working extensively to protect and market the authentic prints at large scale. 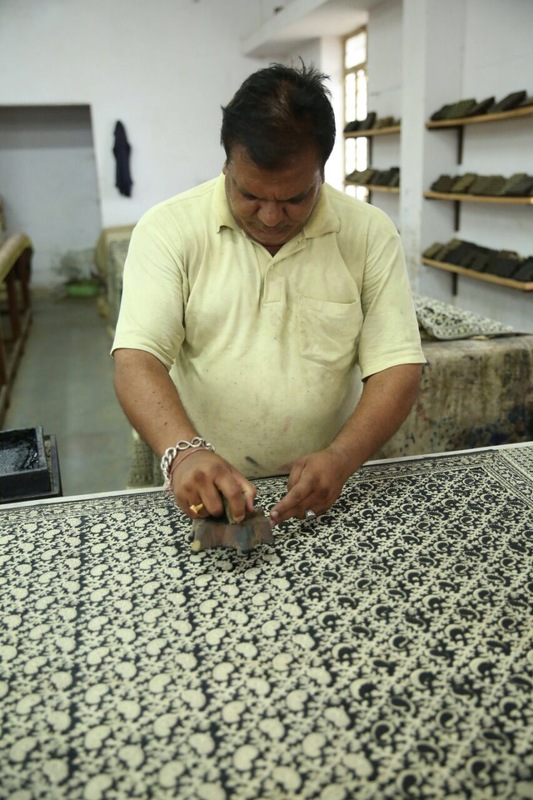 Manufacturers like Lal Chand are also ensuring that the original prints are still relevant. Lal Chand’s fabrics are sold across the world. He even gave training at Prince of Wales Museum Mumbai about the natural hand block printing. 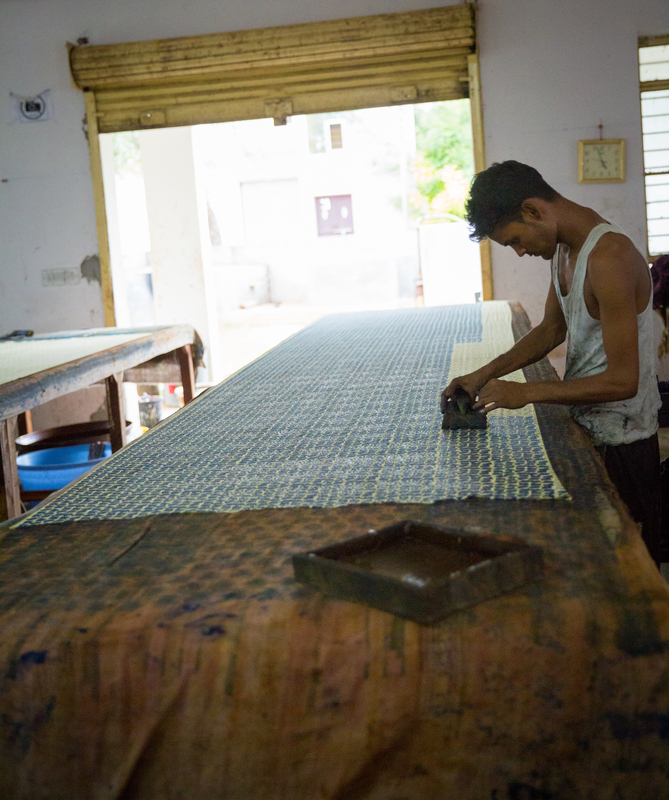 A company, Bagru Textiles, is bridging the gap between the artisan and the market. Aavaran- Echoes of Rural India, also aims to empower artisans and promote traditional art. 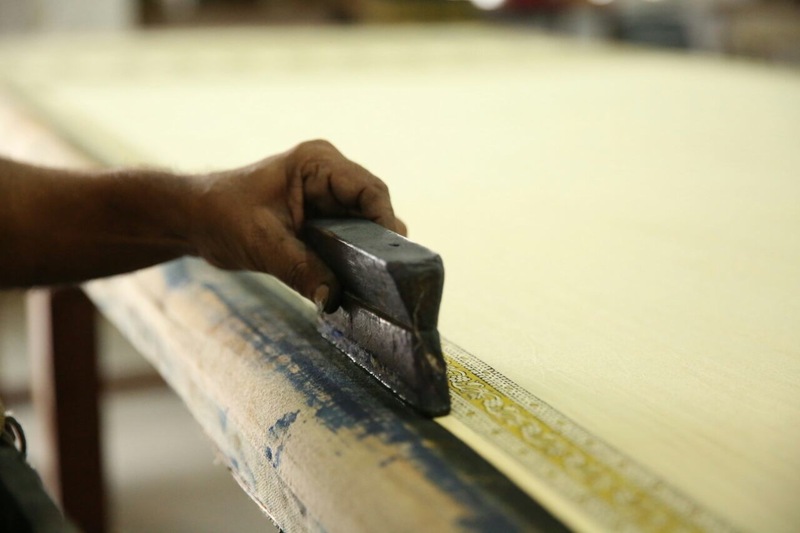 Aavaran’s attempt is to evolve the traditional ‘Dabu’, Mud resist technique of printing, specifically ‘Phentiya’ print, while consistently innovating on design and quality. “This is not just our source of livelihood but also our happiness and pride,” he said. Lal Chand does not want to restrict this art to himself. He wants to spread this across the world. “I don’t care if my business flourishes a lot or not. My wish is to set up an institute so that I can teach hand block printing to the younger generation. I also want to create a hostel where students can stay and be part of this industry. I will also spread the word about this art so that the global demand for this print increases,” Lal Chand added. 1. Bagru prints are done on off-white, beige and light yellow background. First, a white cloth is dyed using Halda powder and water. This cloth is then dried and is ready for further printing. 2. The main colours used in Bagru printing are black, red and maroon. These three main colours are extracted naturally. Black is derived from the worn-out iron horse or camel shoes soaked in water, red comes from gum paste and phitkari, and maroon is a result of mixing the above two colours. 3. Using unique wooden blocks, several designs are printed on the cloth. A certain amount of pressure is applied while printing these designs so that the designs come out evenly. As the amount and number of colours increase on the print, the cost of the fabric increases. 4. After printing, these clothes are dried in the sun for a day. 5. Once dried, these clothes are washed in plain water. 6. To make these colours stronger, these clothes are then dipped in warm water in a brass oven. 7. The cloth is again dried and is finally ready. 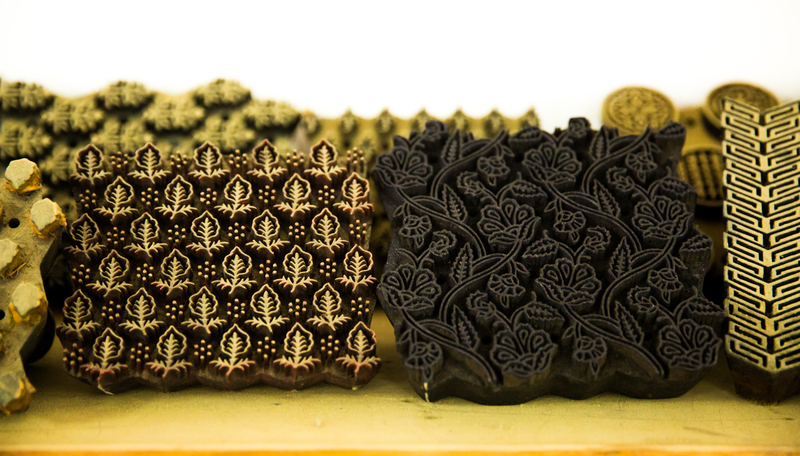 This intrinsic process has made block printing one of the slowest textile printing processes of the world. 8. Bagru, Dabu and Sanganeri prints are all types of different hand block prints and have different procedures. What you can do to sustain this industry? 1. Purchase the authentic hand prints only and avoid chemical and screen prints. 2. Try to buy the products directly from the artisans. 3. 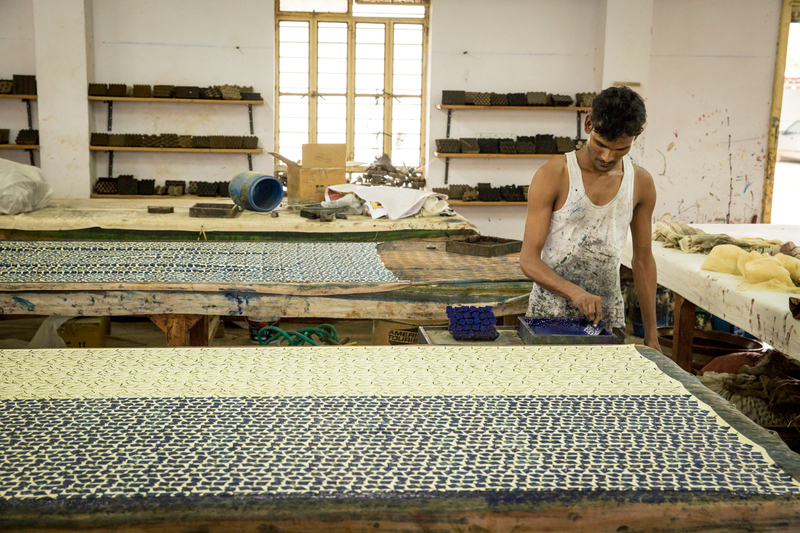 Meet these artisans and boost their morale so that they continue to make amazing products like these. 4. Spread the word about this art. 5. You can visit Anokhi Textile Museum in Jaipur to know about the traditional art of Block Printing. 6. There is also a need to spread awareness about authentic and original hand block prints so that customers can identify them. “The government should provide classes for school students to make them understand this craft and culture. This is how they will respect these skills. The government has provided trademark for the handloom sector. A similar trademark should be there for our industry because many times people just want to buy branded products,” said Lal Chand. How to identify original hand block prints? 1. Original hand block prints will have small flaws in the print since it is entirely a manual process. Whereas the screen print will be spread evenly. 2. One can also notice drops of extra colours here and there if the print is original. 3. The designs will also not always be in the same place. They will be a little displaced from the exact spot because of printing by the hand. Whereas screen prints are evenly printed. 3. Screen prints cover a large area of the cloth while printing and this is why the whole print looks same. But hand blocks are used in a very small area on the cloth at a time. Hence, the colours and the print might vary a little bit. 4. In screen prints, you can find a wide variety of colours. Whereas, original hand block prints come in very limited colours (dark red, yellow, green, black). 5. Natural dye is done only on an off white/yellow base but chemical printing can be done on a white cloth as well. 6. The original hand block prints look as if they have been filled with colour using brushes. Some inputs for the story from Dekha Andekhi, a documentary by Akash Kamthan. You can contact the humble artisan Rajkumar Dhanopia here- +91 9784630373 and Lal Chand jee through their website. 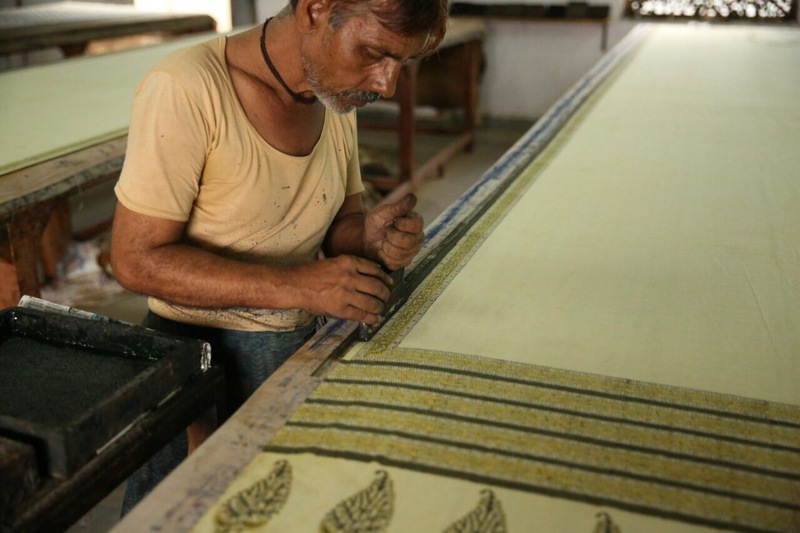 If you have inspirational success stories of artisans, please share them with us so that we can spread a word about their amazing work and connect them to the right people. You can write to us at – thestoriesofchange@gmail.com. Follow us on Facebook and Twitter for more stories like this.